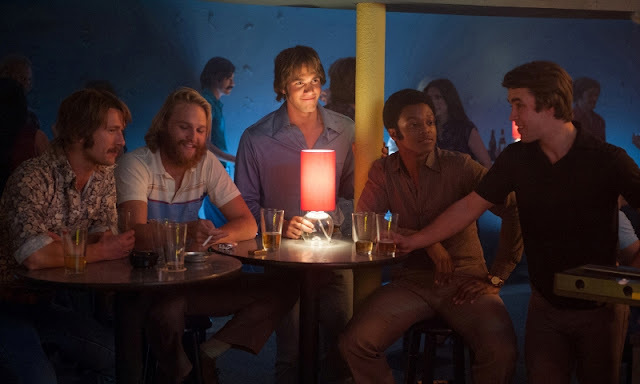 Everybody Wants Some is the latest film from Richard Linklater (Boyhood) and follows the exploits of an early 80's college baseball team as they enjoy their first few days of the school year. The cast of the film includes Blake Jenner, Justin Street, Ryan Guzman, Tyler Hoechlin, Wyatt Russell, Glenn Powell, and Zoey Deutch. This film is meant to be a spiritual sibling to Dazed and Confused, the film that put Linklater on the map and kick started what has turned out to be an impressive career so far. While I see the similarities in tone and style, that's really about as far as the spiritual connection goes, aside from the film being set in the 1980's. While this movie is funny and reasonably entertaining, it falls well short of the iconic cult status Dazed has earned over the years. I see where Linklater was going with this film and what it could have been, I just feel like it's incomplete in a few different ways. On the plus side, the actors are all really good and you really feel like you are right there participating with the group of young men as they go from one drunken adventure to the next. Zoey Deutch is actually pretty fantastic in what is really the only female role of any significance although even her screen time is pretty limited as the focus stays primarily on the team through the entire film. The cast of characters on the team are nicely balanced and there are some very distinct personalities although I still feel like Linklater was shooting for a few of them to really hit home with people in the way that Matthew McConaughey did in Dazed. I know it's not necessarily fair to keep comparing the two films, but the guy who made them did open that door himself so it's pretty much unavoidable. Everybody Wants Some is a likable film although it is not a very memorable film. If you grew up in the 80's, you will enjoy the music, the fashion, and everything else Richard Linklater throws into the film from that era but, outside of that, there really isn't anything about this movie that stands out. I don't want you to think I'm bashing the film, I did enjoy it and am glad I watched it, it just felt incomplete like it was the first half of a much bigger and better story.